Outdoor spas come in two basic categories: portable, factory-made acrylic hot tubs and custom-built, inground concrete (gunite/shotcrete) spas. Each type offers unique advantages and disadvantages, so it’s important to understand the difference between the two so you can select the right one for your needs and lifestyle preferences. Portable hot tubs are freestanding structures—typically round or square—that are manufactured in a factory. The majority have hard interior shells made from acrylic, thermoplastic, or vinyl. They come in several sizes and in a wide array of colors with a smooth interior surface and glossy finishes. Specialty patterns that resemble granite or marble are available, as well as earth tones, desert sands, ocean surf, and other decorative styles. Produced by companies that specialize in hot tub fabrication, units get sold to dealers around the U.S. for local buyers. Typically, a dealer arranges for the delivery and simple installation in a backyard (or appropriate indoor space). Hot tubs consist of two chief components: the interior shell and the outer cabinet. The shell is vital, as it determines the tub’s overall strength and durability. The shell also plays a major role in the unit’s ability to withstand the chemicals needed to keep the water sanitized. Also, you will see it every time you get into the hot tub and once you are inside, you will feel it on your skin as well. The cabinet plays a different role. Its job is to enclose and support the shell, as well as hiding from view the various plumbing components and utility connections. The cabinet also highly visible; the unit is a major object sitting in your outdoor space, and its exterior is visible even when you are not using the tub. Prices for portable hot tubs range from $3,000 to $12,000, depending on size, materials, and options. Typically, units come with a manufacturer’s warranty (parts and labor) of three to five years. Manufacturers understand the visual impact of the cabinet, and so they provide a variety of materials and finishes to dress up the appearance. Typically, cabinets are made of either natural wood, such as cedar, redwood, or even mahogany or from manmade composite materials—polymer or plastics—for “faux wood” style. Natural woods make for a beautiful hot tub cabinet. However, they tend to fade quickly in prolonged sunlight, and they require regular maintenance and refinishing to keep up their lustrous good looks. For this reason, many hot tub manufacturers and consumers are opting for more resilient synthetic materials. These UV-resistant thermal plastics combine the natural look of stone or wood grain with superior durability, easy cleaning, and less maintenance than natural wood. Another benefit: They are eco-friendly, as they don’t require the harvesting of old-growth redwoods or cedars. Acrylic is the most popular material used for shells. In large part, it’s a favorite because it offers the widest selection of colors and patterns, making it easier to integrate a tub with surrounding décor. In general, the thicker the acrylic, the stronger the shell. However, acrylic—by itself—does not have enough strength to support the weight of the water in the tub. Therefore, shells are made by joining two separate components: the shell surface and an understructure—typically made of fiberglass or high-density polyurethane foam—that provides the structural integrity and strength of the tub. Another option for a shell is vinyl. This material is the most affordable choice, making a vinyl hot tub the lowest price option. However, with low price comes a drawback: vinyl shells are easily damaged; they do not stand up well to chemicals, especially if you do not maintain proper water chemistry for long periods of time. A new kid on the block for hot tub shells is thermal plastic. Although thicker and more durable than acrylic, a thermal plastic shell can become discolored over time due to rust or poor water chemistry—such as out-of-whack pH balance, high disinfectant levels. So, if you opt for this shell material, be sure to correctly maintain your water at all times! To fabricate a shell, manufacturers heat the material and form it with seats and openings for a variety of features. Depending on the design, the shell can include a variety of seating options, such as lounge seating, therapy seats, and foot wells to provide plenty of foot room. Many shells also include strategically positioned grab bars—which can come with their own lighting—to improve safety when entering or exiting the tub. Perhaps the single-most vital feature of a hot tub are the jets, which provide the relaxing hydrotherapy that people seek. Hot tub manufacturers offer a massive array of jet types and options to choose from, each with unique kinds of massaging action and sensations. Units include anywhere from 10 to 160 jets, and many are adjustable for direction, speed, and intensity. A primary advantage of portable hot tubs is just that—their portability. They can be quickly and easily installed almost anywhere your home has a flat surface of sufficient size and flooring and underlying structure able to handle the weight of a hot tub once it’s filled with water. If you ever want to change the tub’s location, you have the flexibility to do so. Although hot tubs are heavy—typically weighing 400 to 700 pounds (without water)—they can be drained and moved to another spot, including a new home if you move or sell the unit to someone. If you live in a cold climate, having the option to install a tub almost anywhere around your home can be an important consideration. For example, you can position it close to the back door of your house to avoid longer walks in the frigid night air after a hot soak. If you have the right kind indoor space, a hot tub can go inside so you can use it whenever you want—regardless of the weather. Depending on the size, hot tubs seat from four to 12 people. Models boast integrated, smooth, contoured seating for maximum comfort. Many shell designs include seats at different heights to accommodate everyone from small children to tall adults. There’s a hot tub jet that’s specifically designed to help relieve muscle tension and aches on nearly every part of your body. For example, hydro-massage jets create a powerful water stream for a deep massage to alleviate muscle tension. For more sensitive areas, precision jets are engineered to mimic a massage with fingers, providing a lighter touch on delicate areas of your body. The largest tubs offer up to 160 jets of different types, including swirl, mini, whirlpool, pillow, shoulder, and moving massage. There are even jets positioned to target your feet. Many models also offer independent seat controls so that every person can enjoy his or her custom jet settings. Other fun features include LED color-changing lighting, integrated sound systems, and programmable timers. Many models can even incorporate an integrated spa-mounted television with a waterproof remote. In addition to their portability, hot tubs are ultra-convenient to use. Because they keep the water hot all the time, you don’t have to preheat it before every use. Simply change into your swimsuit and climb right in! Hot tubs run using electricity; depending on local rates, they typically run around $20 to $30 per month to operate. Other than good water-quality treatment, they require little maintenance and service. One exception is if you have a natural wood cabinet. Manufacturers recommend cleaning it every three to four months with a gentle cleansing agent. Applying a linseed oil/staining treatment once a year will keep the finish looking shiny and new and extend the life of the wood. Most tubs come with a standard cover to help retain heat and keep water clean, and this practical accessory takes only seconds to put on and take off. 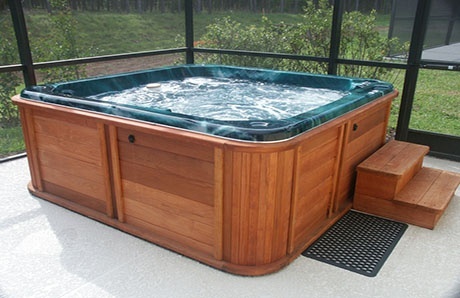 Although hot tubs come in many styles and colors, they are premade in a factory, vs. custom-built. That uniformity limits their design—and more importantly how well they blend with their surroundings, such as a custom backyard pool or built-in island grill faced in natural stone. Many models have a somewhat bulky appearance, making them less attractive than a custom concrete spa. Because a hot tub stands on a surface, its sidewalls are always visible—versus a custom concrete spa with a structure built into the ground or that’s seamlessly and beautifully integrated into an inground concrete pool. Some hot tub models offer cabinet colors that allow you to achieve some degree of color coordination with your backyard setting. However, unlike concrete spas, you can’t customize one to perfectly match your pool or harmoniously blend with your backyard setting. As acrylic hot tub shells age, the underlying fiberglass can sometimes separate from the acrylic, a process known as delamination. That’s why it’s particularly important: to check guarantees when buying a hot tub with an acrylic shell; be sure to read the warranty about not only the shell but about its surface. Although the interior surfaces are smooth and comfortable to sit on, they can also be slippery—posing a potential safety issue when entering and exiting. If you have young children or elderly parents who will be using the hot tub, choose a model with built-in grab bars that offers a good way to improve safety. Product endurance is another consideration. The materials used to manufacture hot tubs don’t always hold up as well over time compared to the structure of an inground concrete spa. Above all, your individual budget and home-improvement plans should come into play. Although most hot tubs sell for less than their custom concrete counterparts, long-term ownership costs may be higher over time. Now, if you want a spa and are building a new inground concrete pool, it makes the most sense to include a custom spa with the pool structure. However, if you want a spa, but you have a small backyard and/or no interest in building a pool, then you have a serious decision to make. On the one hand, a hot tub is often the way to go in this case. That’s due to the benefits outlined here. On the other hand, if the beauty of your backyard is paramount, then a custom inground spa can provide a more distinctive, more permanent addition that enhances your backyard.